Creator and founder of the project, Tiziana is passionate about rhythms. Her stage career started as a flamenco dancer (1995 to 2004), where she discovered the cajòn, originally a Peruvian instrument adopted by the flamenco tradition. Subsequently devoting herself to the congas, she studied at the École de Jazz et Musique Actuelle in Lausanne, where she was inspired to harmoniously combine the two percussion instruments in the rock project KILIRADIO. Tiziana brings a particular touch to their musical style, intensified by her deep and interpretative voice. Band co-founder, Oliver has always been passionate about the guitar since he was a teenager. After experimenting with various musical styles, he enrolled in the École de Jazz et Musique Actuelle in Lausanne. In the 90s, he played solo guitar in the blues band Jesse James & The Gangsters, selected for the opening act B.B King’s concert in Lugano in 1992. Prolific songwriter, he enriches their style by his deeply captivating and charismatic voice. Currently he teaches music at the Yverdon Conservatory. Versatile musician, multi instrumentalist. Leader of the band Treesize as singer and guitarist, Max boasts collaborations with renowed artists such as Rossana Taddei, songwriter from Uruguay. He worked with Raissa Avilès, in her Mexican folk project, and Francesco Pervangher, pop songwriter from CH-Ticino. Seasoned musician at ease with various styles both as a guitarist and bass player, Max is greatly valued and appreciated all round. Highly experienced drummer, Reto has shown great musical sensitivity in his various collaborations, most recently : Powerglide (hard rock) and Trouble Makers (neo rockabilly) finalists at the Palco ai Giovani 2012 Contest. Greatly appreciated, not just for his extreme resistance (!) but also for his joyful symbiosis with his instrument – simply fascinating to witness! CH-Lausanne is the meeting point of the unbreakable founder duo, coming from South of Switzerland, backbone of the band : Tiziana Ghiringhelli (vocals-percussions) and Oliver Frei (vocals-guitar). After successfully collaborating from 2002-2007 in the pop band Tamuera, they formed KILIRADIO with the original intention to propose personal interpretations revisiting 60's-70's cult rock songs. Almost immediately, this shared alchemy full of enthusiasm and creativity gave way to new original groovy compositions, finding their place within the "Adult Alternative Rock" landscape. Performing with various artists from 2013, KILIRADIO finally welcomed two permanent members : Max Frapolli on bass and Reto Brogli on drums. 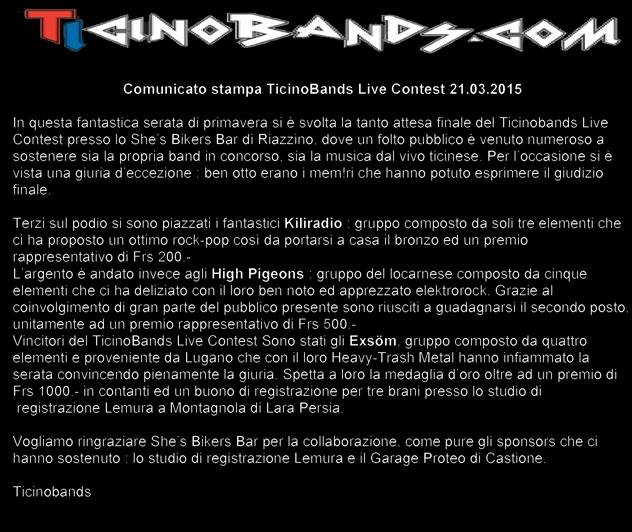 Loved by the public for their empathetic and communicative musicality and peppy interpretations, KILIRADIO is selected for the musical competition TicinoBands Live Contest 2015 and arriving all the way to the final. This prize encouraged them to record Feathers & Stones, album with 11 new original songs, giving way to plenty of concerts. In spring 2017 single release, Beautiful Thing (I miss you), in a sunny funky-rock style, immediately loved by radio stations ! In spring 2018 new single release, Call me Rock'n'Roll, with official video. Summer 2018 video release Beautiful Thing (I miss you). The band is now working on their next album, so STAY TUNED ! >>>> new album soon !